The man, described as being in his 20s and as having cognitive delays, was not injured, but was transported to an area hospital as a precaution. 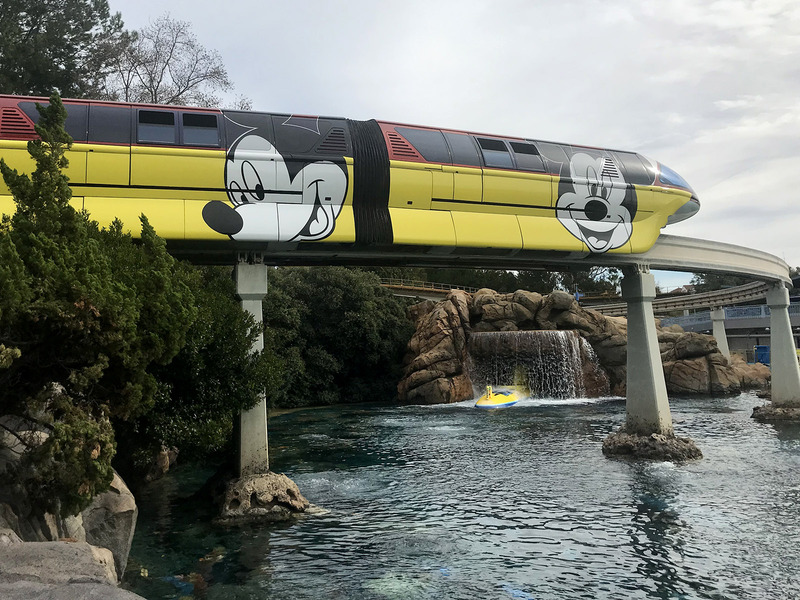 The ride remained closed for several days while the California Division of Occupational Safety and Health investigated how the man got out of the vehicle, and why safety sensors did not immediately trigger an emergency stop. The ride was previously scheduled to close February 25 through March 14 for unrelated refurbishment. Ever since Ariel's Grotto closed last January to make room for the Lamplight Lounge in Disney California Adventure, parents and princess fans have asked for a replacement for the character breakfast once offered at that location. The Disneyland Resort offers four character breakfast options where fans can meet Mickey and friends, but the Disney Princesses remained elusive. Starting March 30, Disney's Napa Rose restaurant will host the new Disney Princess Breakfast Adventures, an experience that comes with a royal $125-per-person price tag. The Disney Parks Blog last week provided a brief description of the event, and noted that characters may include Belle, Tiana, Ariel, Jasmine, Mulan, Rapunzel, and others. From the description, it seems the event takes place in stages, with a welcome in the Napa Rose Lounge before breakfast inside the restaurant. The experience ends with princess story time on the Napa Rose patio, as princesses "share the moments they felt empowered to be their true selves," and a photo opportunity. Disney's article puts a big emphasis on the "experience" portion of this character breakfast, which serves to both explain the higher price point, and also distract from the very unusual breakfast menu. Breakfast service begins as early as 8:00 a.m., but the entree selections seem more suited to lunch or dinner. Children can order macaroni and cheese, beef sliders, or chicken and "princess waffles." Adult entrées include shepherd's pie, braised short ribs, and pork belly. The meal ends with a dessert course that includes cake pops and fruit tarts. There may be more traditional breakfast/brunch items available, but Disney has not yet posted the full menu. The new breakfast experience is available Thursday through Monday only, from 8:00 a.m. to noon. A credit card guarantee is required for all reservations, and a fee of $10 per person is charged for no-shows or reservations canceled less than 24 hours in advance. You can book a reservation online at the Disneyland website, or bu calling (714) 781-3463. As of publication, reservations were open only for the first four breakfast events, and all were still available. However, the first Sunday, March 31, is very close to selling out. Disney calls this a one-of-a-kind occasion, and it's certain that it will appeal to a segment of the Disney guest. However, the price point will make many parents think twice about bringing the whole family. Parents sometimes find it a hard sell to get their sons to accompany their sisters to the Ariel's Grotto breakfast at DCA, or to sit through Cinderella's Royal Table at Walt Disney World. Still, they make the reservation, if only for the sake of family togetherness. At $125 per person, parents may be less likely to drag children—or unwilling spouses—along to this breakfast adventure, especially when that same $125 represents all or most of a one-day theme park ticket. To put it in perspective, $125 is the cost of a six-course meal at the Napa Rose chef's counter, and significantly more than any child's meal would cost at the restaurant during dinner. If I wanted to splurge for breakfast with a princess-crazy child, I'd probably send the rest of the family into the parks. One final note: With the exception of a very brief trial run more than a decade ago, Napa Rose has not offered brunch service, although fans of the restaurant have often requested it. If this princess meal fails to attract enough diners to justify continued operation, we hope the door might be open to a classic brunch offering at the restaurant in the future. Children's Hospital of Orange County asks you to Save the Date for the 2019 CHOC Walk, which returns to the Disneyland Resort on Sunday, August 11. 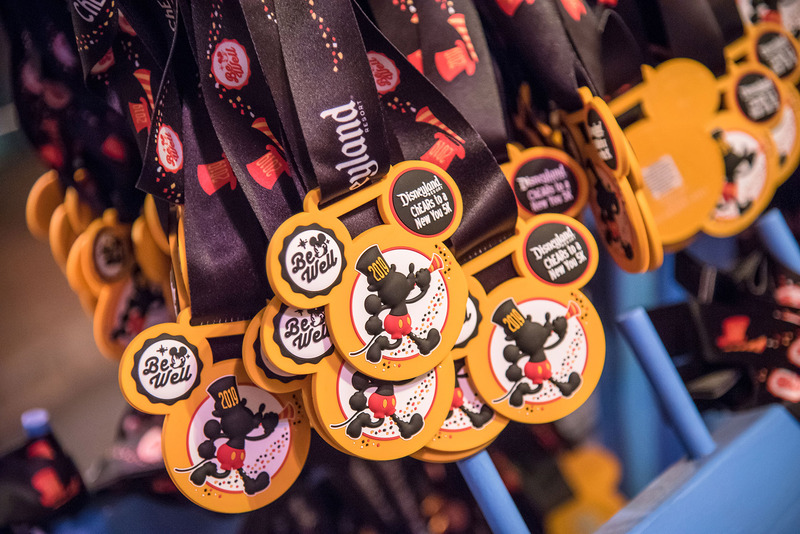 The annual event is the largest fundraiser for the hospital, and draws thousands of people to the Disneyland Resort during the pre-dawn hours for a 5-kilometer (3.1-mile) walk through Disneyland and Disney California Adventure. Registration opens in late February, and Team MousePlanet will once again participate. Thanks to the efforts and generosity of our readers, Team MousePlanet has raised over $75,000 for CHOC Children's since 2008. Will invite all MousePlanet readers, friends, and family to join us at the 2019 walk. We will share registration information as soon as we have it. This item will make a whole lot of Team MousePlanet readers sad: Disneyland had a 5K last month, and you probably weren't invited. Disneyland Resort cast members, friends and family run in the ChEARS to a New You cast 5K. Photo © Disney. Over 2,600 people participated in the ChEARS to a New You cast 5k on January 20. 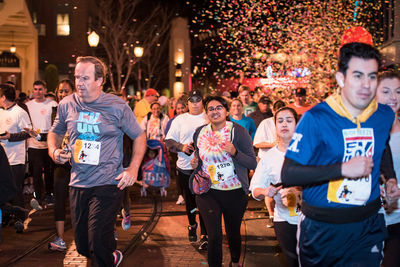 The 3.1-mile course started with a confetti burst in Disney California Adventure, and ended with a finish line on Main Street, U.S.A. inside Disneyland. Along the way, Disneyland Resort cast members, friends and family stopped for photo opportunities, met Disney characters, and ended with an exclusive 5K medal. Ashley Chen, a Disney PhotoPass photographer, said, "It was a great experience. Even seeing all the cast here early and working the event was amazing. Everyone was pushing each other to keep going and I’m happy to be a part of a community that wants to be healthy." Participants in the fourth 5K event earned an exclusive medal. Photo © Disney. The fun run was the Disneyland Resort's fourth 5k event held for cast members and their guests. As mentioned above, the Resort will also host the CHOC Walk on Sunday, August 11. But for the time being, large runDisney events are still on hiatus in Anaheim. Los Angeles Rams fans won't get to see their Super Bowl hero parade down Main Street U.S.A. this year, but fans of the Anaheim Ducks can celebrate their team's 25th anniversary next Monday when the Ducks take over Hollywood Land at Disney California Adventure. Stage 17 will serve as fan headquarters, where Ducks fans can see a collection of team memorabilia, take photos with Ducks mascot Wild Wing, and play around at table and air hockey offerings. Outside Stage 17, fans can buy some new souvenirs, including limited edition Anaheim Ducks Day apparel. Anaheim Ducks “Through The Years,” will play in the Sunset Showcase Theater from 8 a.m. to 7 p.m. This film is a highlight reel of 25 years of Anaheim Ducks hockey, including their 2007 Stanley Cup championship. Anaheim Ducks players will participate in a cavalcade at 1:15 p.m., with viewing along Hollywood Boulevard and Buena Vista Street. Players and alumni will also participate in meet-and-greet sessions with fans outside Stage 12 at 2:15, 3:15, and 4:15 p.m. Fans who want to meet a Ducks player must obtain a wristband from a distribution location inside Hollywood Backlot starting at park opening (8:00 a.m.) on February 11; fans are limited to one meet-and-greet, and space is limited. Of course, Disney's foods department got into the game, and will offer a trio of hockey-themed treats. Find the orange cream puck at Trolley Treats, an anniversary-inspired macaron at Studio Catering Co., or hockey puck-themed brownie at Schmoozies. 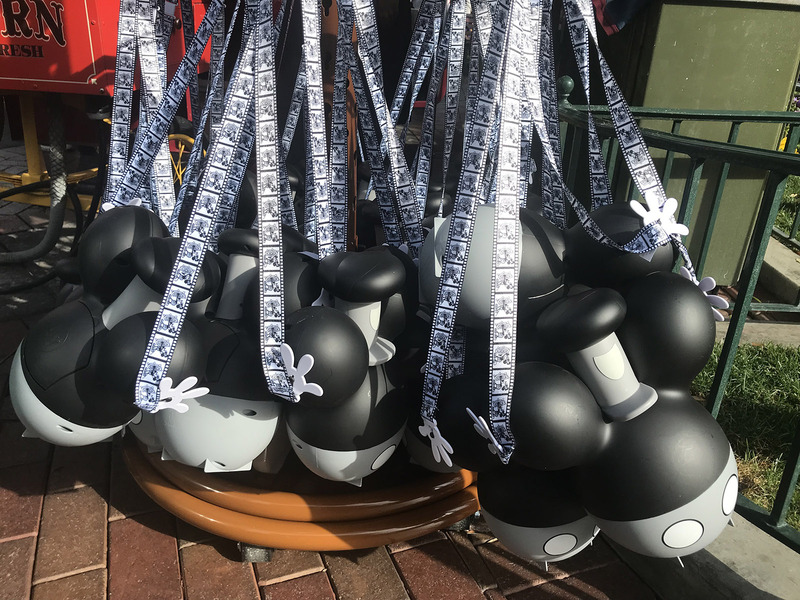 ...Disney released the Annual Passholder-exclusive Steamboat Willie popcorn bucket last Friday, and is reportedly already sold out. The $20 bucket allows passholders to purchase $1 refills through through March 7, 2019. Passholders waited in long lines Friday to purchase the latest AP-exclusive popcorn bucket. Photo by Adrienne Vincent-Phoenix. ...The sold-out Disneyland After Dark: Sweethearts Nite event is this Thursday, February 7 at Disneyland. 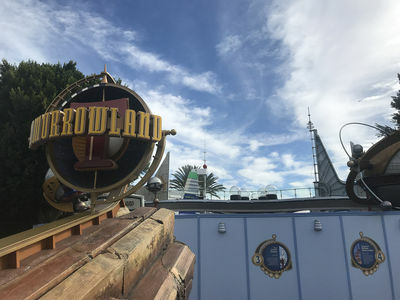 Disneyland's Astro Orbitor is closed (and removed) for renovation, giving visitors a view of the Tomorrowland entrance not seen since the late 1990s. Photo by Adrienne Vincent-Phoenix. ...Splash Mountain closes today for refurbishment, and is scheduled to reopen February 15. Sleeping Beauty Castle is mostly under wraps during refurbishment. Photo by Adrienne Vincent-Phoenix. ...Disney will update the Disney Destinations Reservation System starting today, and room and package bookings will not be available either online or via the call center Monday, February 4 through Tuesday, February 5. This outage will likely also affect travel agencies. 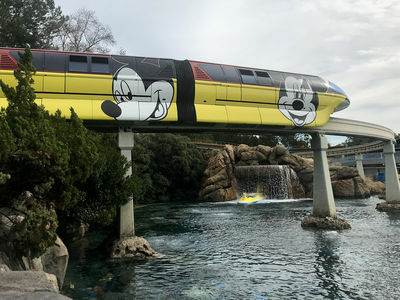 Disneyland's Monorail Red sports a new wrap for the Get Your Ears On promotion. Photo by Adrienne Vincent-Phoenix. ...The Salt & Straw scoop shop in Downtown Disney debuted its flavors for the month of February, and it should be no surprise that the collection is themed to chocolate. The company worked with Portland-area chocolatiers to create the limited-time flavors, which include Eclipse’s Cardamom Rose Chocolate, Compartes’ Coffee & Love Nuts, and the vegan Nibble’s 85% Peruvian Chocolate Sorbet. These three flavors will be available through the end of February. Astro Orbitor – closed through at least March 17 for refurbishment..
Sleeping Beauty Castle Walkthrough – closed through at least March 17 for refurbishment. 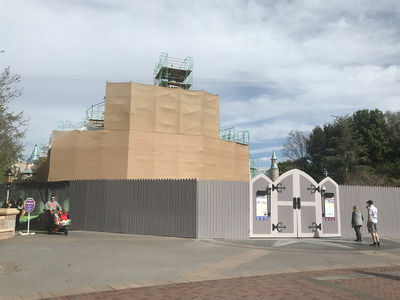 Sleeping Beauty Castle Enchanted Chamber – closed through at least March 17 for castle refurbishment. Grizzly River Run – closed through at least March 17 for refurbishment. Silly Symphony Swings – closes March 1 through at least March 17 for refurbishment. Tangaroa Terrace (Disneyland Hotel) – closed for refurbishment and expansion to the "Tangaroa Terrace, Tropical Bar and Grill"